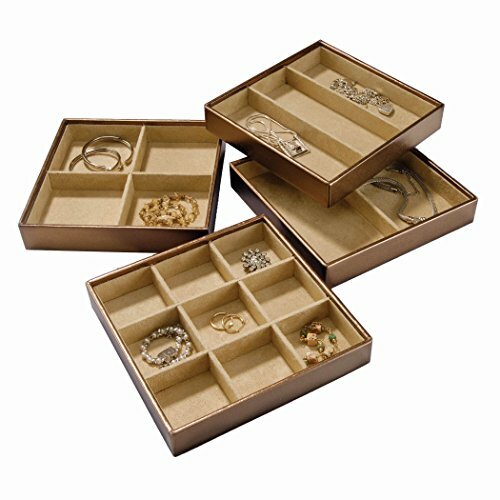 The traditional way to organize jewelry has been a jewelry box. These could be anything from a simple box on the dresser to a piece of furniture all its own, it all depends on how many pieces you need to store and wear. n’t have to go digging, and getting them organized will help you quickly match the pieces to your outfits. For me, personally, earrings were always a problem. I would have them in a dish on my dresser and could never find the matching one quickly. I would end up dumping the container onto the bed to find it. There are a few ways to utilize some drawer space for your pieces, and if you use the right setup you can house hundreds of pieces in a small area. If you have the depth in your dresser drawer or bedside table, you can use each tray for particular pieces. One tray for bracelets and bangles, and another for necklaces and another for broaches, you simply lift each tray to find the right piece. This can be a fun project for getting organized and you will be amazed at what you can find buried deep in that old jewelry box. Getting things off surfaces makes the room easier to clean as well and doesn’t leave them out to collect dust. If you don’t have a lot of pieces, but they are varied, this tray will house them all. You can get extra trays to stack and they are made from a soft flocked material that will protect your good pieces from scratches. Keeping the pieces separated is key to organizing and keeping them in good shape. After all there can be a significant investment in jewelry; you want to keep it safe and clean. Getting them off the dresser top or open storage will keep the dust off them too. This is where I have problems. I just recently purchased a new dresser and I am dedicating a top drawer section to my earrings. 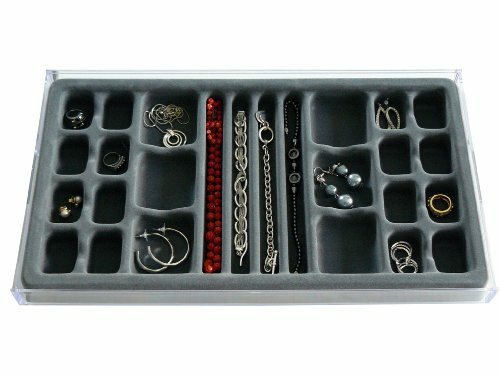 I don’t always wear a lot of necklaces but I do like earrings, so getting trays that can house each pair so I can see them right away in the morning saves a lot of time. I would tend to keep wearing the same ones rather than go digging for other pairs if I was in a hurry. This way I can match them to what I am wearing quickly. Once I started organizing them, it was like Christmas! I found earrings I had forgotten I even owned. I gave them a good clean and then separated them into compartments like this storage tray. These are also stackable and can still fit in a standard drawer. It is a great way to utilize the depth and space in a drawer and keep them clean and safe and organized. If rings are your thing, just like earrings they can end up in the abyss of a bowl on the dresser, bathroom vanity or nightstand, and then lost. By using one of these organizer trays, you can not only quickly grab the one you want but it is easy to put them away. I always found the minute there was some complication to putting them away it didn’t happen. 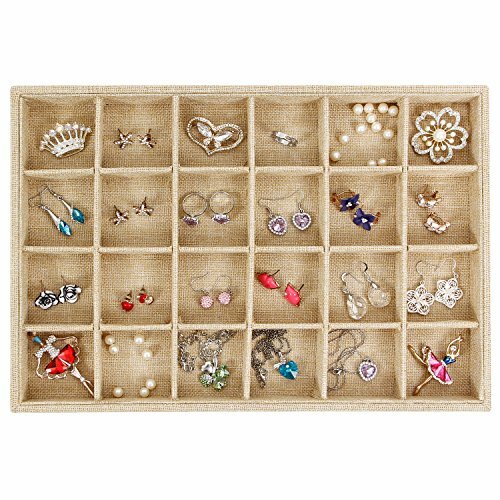 I used to have a earring organizer that you had to literally pin or hang the earrings and it was a bit of a pain to get them off quickly so they ended up on the dresser or in a bowl. I like simply organizing ideas. 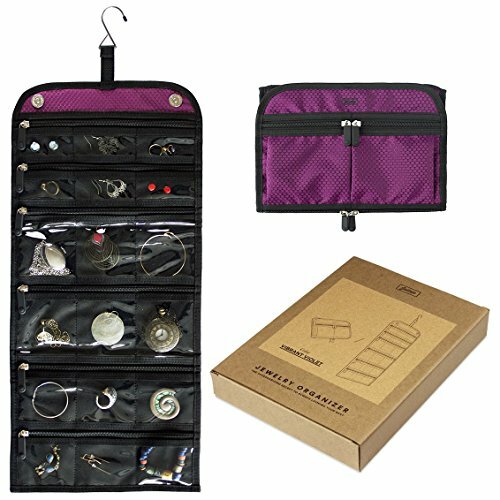 Hanging Jewelry Organizer - Roll Up and Take With You! 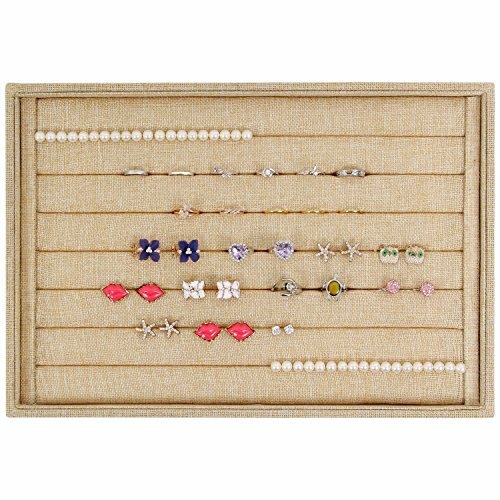 If you find you just don’t have the room for drawer storage when it comes to your jewelry pieces, there is always this hanging option. You literally can organize the pockets and hang it in your closet, but what I love best about this jewelry organizer is that you can simply roll it up and pack it to take away with you on vacation! You don’t have to have a separate travel case and take the time and effort to pick the right pieces. If I went away I tended to just simplify my accessories just so I didn’t have to deal with it. It would be nice to be able to dress up like you do at home while away, by simply rolling this up it can travel with you and hang in any closet. Another option if the budget is tight is the dollar store. You can get plastic storage containers that are designed for tiny nails, screws, and other bits of hardware that you can use for your earrings and other pieces. You can still get organized on a tight budget! These have lids you could remove and then place the trays in your drawer. Organizing jewelry into a drawer helps with two problems, tangled pieces, dusty pieces and keeping them off the surfaces and safe. Maybe it is time to get rid of that cumbersome large jewelry box that you don’t use properly i.e. : chains hanging off the sides of it, and donate it, and organize your jewelry into a drawer where it is easy to find and put away.